Chances are if one were to poll SABR members about the greatest left-hander in the more than century-long history of the Dodgers franchise, the most frequent response would be, “Sandy Koufax.” But they would be incorrect. Without a doubt, the honor of greatest southpaw in organizational history belongs to Vincent E. Scully. Since the emergence of radio-broadcast baseball, America’s love and fascination with the sport has been amplified by the play-by-play announcers who describe and interpret the strategies and resulting action with their own unique conversational style and insider baseball knowledge. On the surface it seems simple enough. The broadcaster watches the game from a booth overlooking the diamond and speaks into a microphone headset reporting the game. But it is much more than that. The principal announcer, the team’s `voice,’ is the embodiment of the link between the team and its loyal fans. No one is a better illustration of that nexus than the Dodgers’ Vin Scully, whose professional work for the organization has spanned two coasts and over sixty consecutive years. Scully’s remarkable career with the Dodgers began in 1950, eight years before the team pulled up stakes in Brooklyn and headed west. No one has called the play-by-play for one team longer. Only two of the major league stadiums remain from his rookie year. A full six decades? It is likely we’ll witness Joe DiMaggio’s 56 game hitting streak surpassed or Cal Ripken’s consecutive games tally streak shattered before the one Scully established is matched. Scully’s constant presence in the tapestry of Dodger baseball history extends into the various eras and themes that run through its history. Scully was there, of course, to call the seasons that saw the Dodgers capture five National League pennants in the 1950s, and three more with Sandy Koufax-Don Drysdale-Maury Wills-Tommie Davis in the span between 1963 and 1966. He covered the swinging ‘70s with the likes of the record-setting infield of Ron Cey, Bill Russell, Davey Lopes and Steve Garvey, who brought three additional National League Championships to Los Angeles; he helped shepherd in Fernando-mania and a World Championship in 1981, and he was up in the booth in 1988 when Orel Hershiser and Kirk Gibson led their team to the last Dodger Series crown. He was there throughout the half-century of the O’Malley family ownership, the complete managerial careers of Walt Alston and Tommy Lasorda totaling 43 seasons, the seasons of the 12 Dodgers who have won the National League Rookie of the Year Award in Los Angeles, and during the debacle of the Fox ownership of the Dodgers. Up until his recent skirmishes with Major League Baseball, when current Dodger owner Frank McCourt wanted to introduce organizational change, he knew having Vin Scully at his side made the public vetting more palatable. Educated at Fordham University, with a short break for service in the U.S. Navy towards the tail end of World War II, he became a member of the initial class of students admitted to the new radio communications program. There, Scully received hands-on experience working at radio station WFUV, handling college football, basketball and baseball games, as well as a score of other programming and station responsibilities. When Barber balked at covering the 1953 Dodgers-Yankees World Series, the plum television broadcasting assignment was offered to Scully, with his mentor’s blessing. The credible job he did [paired with Mel Allen] had viewers and the sporting press taking notice of the lean red-headed broadcaster.13 Barber soon ended his fifteen-year tenure with the Dodgers and went cross-town to the Yankees while Desmond became increasingly unreliable with periodic bouts of alcoholism. Scully was elevated to the top spot following the 1954 season. The Sporting News wrote about Scully in 1955: “He has a clear voice and a casual, friendly manner that projects comfortably over the air. He stays alert and displays an unmistakable grasp of his subject.”14 Nothing in the intervening decades would change that assessment written some fifty-five years ago. Players like Pee Wee Reese, Jackie Robinson, Duke Snider, Roy Campanella, Gil Hodges, and Don Newcombe had long been excluded from the champagne drenching that accompanied the celebration and crowning of baseball World Champs. The 1955 fall classic went down to the seventh game, with Johnny Podres shutting out the Yankees 2-0. When the Dodgers moved to Los Angeles following the 1957 season there were those within the organization who believed Scully should adjust his style to better promote the relocated team to its new audience. And, strong consideration was given to replacing Jerry Doggett (who had only joined the Dodgers broadcast team in September, 1956) with a local announcer already familiar to Southern California listeners. This was to be a new start. Scully made the case to Walter O’Malley for Doggett to remain his sidekick and eschewed openly rooting for the Dodgers. Doggett remained in the booth together with Scully for nearly a third of a century, each calling his own innings. 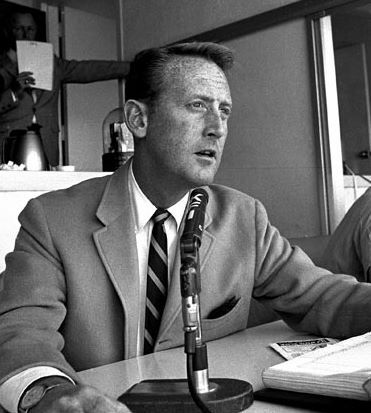 There was another reason fans felt compelled to bring their portable radios to the ballpark: Vin Scully instantly captivated the Southland. Then, as now, his Irish lilt made baseball what it was supposed to be: entertaining. It was natural for Angelenos to wonder beyond the mere statistics: just who were these guys? “Although people were aware of some of the superstars, they weren’t aware of the rank-and-file ballplayers,” said Scully. “So they brought their radios to hear me tell them about the players.”18 Scully adeptly sketched their personal histories, provided color to go along with the game’s action, something in which he particularly excelled. Moreover, with the exception of road games in San Francisco against the Giants, no Dodger games were shown on local television. For many years, throughout the late 1950s and through the 1960s, radio would be king in Los Angeles. Another contributor was that the expansive region was dominated by cars, and the concomitant traffic jams. When the Dodgers played on the road against anyone but the Giants, the three-hour time zone difference meant the games were just beginning as the 5 pm work whistle sounded, and drivers headed home on the area freeways. Factors such as these helped cement the relationship between Scully and his listeners. “More than anyone, Scully made the Dodgers successful in Los Angeles,” Dodgers General Manager Buzzie Bavasi wrote in his memoirs, Off the Record. “He was the biggest asset we had coming to California.”19 Immediately fueling Scully’s popularity was that the Dodgers, following a seventh place finish in 1958, snared a World Championship trophy in only their second year in Los Angeles, which Scully found “thrilling because it was so unexpected.”20 A record album, “Dodgers ’59,” was promptly produced following the season by the Dodgers and their flagship station KMPC, featuring nothing but Scully’s notable calls during the magical year. The tradition of the transistor-laden fan entering turnstiles intensified when the Dodgers moved into their new ballpark in 1962, as all-time major league season attendance numbers were shattered. A cacophony of Scully’s voice over the airwaves could be heard wafting through the Stadium crowd when he was calling the innings of any game.21 During the middle innings (Doggett’s time) batteries were generally conserved. The tradition of many Dodger fans leaving the game early owed much to efforts to try to avoid traffic snarls but also that tuning into Scully was in many ways just as fun and in some ways better than being at the game itself. When Scully was announced as the Ford C. Frick Award for broadcasting excellence in 1982, he was already marking his thirty-first season as a Dodger team broadcaster, roughly 25 of those years as its main voice. Perhaps what is most remarkable in hindsight is that up to that point he had been on the national television stage for baseball only during the occasional Dodgers World Series appearances or to call sporadic All-Star games. His tenure as host of the NBC Saturday Game of the Week was still ahead of him, as were his many years behind the mike for CBS Radio Network coverage of the World Series. However, he already had a monopoly over much of the West by virtue of Dodgers flagship station KFI 640, which carried its clear 50,000 watt signal across the mountains and deserts and as far away as Des Moines and Denver. Not only do few remember Scully’s ventures into daytime television, his work as the primary CBS weekend sportscaster for championship tennis, golf tournaments, and pro football between 1975 and 1982 has now been overshadowed by his long and constant association with the Dodgers. At the time he signed his contract, some sports media pundits questioned whether Scully could readily transfer his baseball broadcasting style and techniques to a non-baseball venue. The Sporting News soon gave Scully a ringing endorsement: “He seems proficient in describing tennis, golf, and other sports as he is in baseball.”26 He became the highest paid sportscaster in the nation at the time. When CBS Sports reneged on a promise to have Scully cover the 1982 Super Bowl, he rejected their new ten-year contract deal but Scully maintained it was primarily due to the fact that he wanted to cover baseball nationally.27 NBC acted fast to sign him up to broadcast “The Baseball Game of the Week.” For seven seasons, from 1983 through 1989, until NBC was out-bid for baseball, Scully greeted television viewers with his friendly invitation to, “Pull up a chair and spend part of Saturday with us.” Fans across the country were finally treated on a weekly basis to arguably the best baseball broadcaster in the business. Yet, as colorful as these descriptions might be, to conclude Scully’s popularity was due solely to his command of language, would certainly miss the boat. The secret behind Scully’s broadcast is that he loves people and finds them interesting. Added to it was a sense of compassion that could not be feigned. Scully was invariably intrigued by the ballplayer who had overcome difficult personal circumstances and he would masterfully weave these personal narratives into the play-by-play without missing a pitch. They were the vignettes of players who toiled for years in the minors but would not give up their dream to find a way to the big leagues. They were the stories of players who were considered washed up but whose careers were revived by another big league club. They were the accounts of players who grew up amid poverty in third world countries. In listening to Scully’s broadcasts, and without being entirely conscious of it, the fan could not help but be moved to have a larger appreciation of the human dimension. These were not just men with bats and gloves, and in recent years, lots of money, but people with their own personal life stories, as well. Although he has kept pace with technology and conducts prodigious research before each game via the internet, Scully has never abandoned his instincts as a reporter to gather information on opposing players from the visiting press or lifelong contacts including coaches and scouts he knows with virtually every team the Dodgers play. Nevertheless, in many ways he would have to be considered old-school. When he walks into a broadcast booth he usually is decked out in an elegant suit from which a handkerchief spills from a front pocket, and he always sports a tie – for no more than about a minute of face time per televised game. He does this as a consummate professional who wants to be reminded when he is in the broadcast booth he is all about business. Not that he thinks of broadcasting baseball as work. “Learn to do something you love, and you won’t have to work a day in your life,” Scully has said from time to time. He is the rarest of broadcasters; he prefers to work alone, speaking to the audience in a one-on-one conversation, and not in reaction to a color man’s comment. He covers each inning of all the locally televised Dodger home games and travels with the team on road trips to Denver and all points west, sitting behind the television mike between 110 and 120 games a year. He is heard on radio as part of a simulcast for the first three innings. The television contract is too lucrative and sponsors too demanding to share Scully more than that. Is there any broadcaster better weaving baseball’s past in with the present? Something might remind Scully during one game of a story involving Preacher Roe throwing his equipment into the crowd. Harkening back to the play of Jackie Robinson, Stan Musial, Henry Aaron, and Willie Mays, or the lesser known likes of Ron Hunt, Chico Ruiz, and Bob Friend, or any of others of thousands of other players he has observed, Scully is well aware that the simple demographics of those tuned into the broadcast would necessarily mean most were born after these players had long called it a career. Scully may not have consciously believed he carried some responsibility to convey to today’s fans some of the game’s history. He obviously felt that by connecting to the past the game became more enjoyable for the fan and provided a context for watching or listening to today’s game. Regardless, it nevertheless never seemed forced when the story involved players or other references from earlier eras. Since 1950, Scully has been getting behind the mike to not just call the play-by-play, but to provide picture word descriptions to make each game truly entertaining, regardless of the score and team standings. He is endowed with several gifts that have put him at the top of his profession, including a great voice, a rich imagination which enables him to incorporate seemingly perfect similes into the broadcast, a contagious enthusiasm for intelligent ball playing regardless of uniforms, and an ability to speak to listeners as if he were merely an old friend. Despite his rise to prominence, having received virtually every national sports broadcasting award possible, including having the press box at Dodger Stadium named in his honor, Scully has remarked many times that he is not special. He has never taken himself too seriously, perhaps illustrated in the following short recollection told over the air in 2010. “Wilver Stargell hit the first ball out of Dodger Stadium in 1969 off Alan Foster” said Scully. “Who called it?” Scully rhetorically asked aloud of his listening audience, before responding, “Jerry Doggett — bless his heart.” He then confessed, ”I was in the rest room.”33 His was just a simple story of a kid growing up in the Bronx — who was able to realize his boyhood dreams. The author thanks SABR’s Andy McCue who provided excellent comments in reviewing this piece. 2 Los Angeles Times Magazine, April 26, 1998; Remarked during Dodgers broadcast, June 15, 2007. 3 Interview with Vin Scully, September 17, 1991. 4 Los Angeles Times, June 1, 1966; Curt Smith, Pull Up a Chair, Washington D.C.: Potomac Books, 2009, pp. 4-5. 5 Los Angeles Times, June 1, 1966. 6 Remarked during Dodgers broadcast, April 29, 1995. 7 Interview with Vin Scully, September 17, 1991. 8 The Sporting News, June 15, 1955; July 24, 1989; Christian Science Monitor, November 10, 1986. 9 Remarked during Dodgers broadcast October, 3, 2010; The Sporting News, June 15, 1955. 10 The Sporting News, July 24, 1989. 11 Red Barber, The Broadcasters New York: The Dial Press, 1970, p. 187. 12 The Sporting News, January 23, 1982. 13 See Red Barber, The Broadcasters New York: The Dial Press, 1970, pp. 185-188. While broadcasting the 1996 World Series for radio, Scully reflected back to his first fall classic and working with Mel Allen. “I remember how extra kind he was,” Scully said. CBS Radio Broadcast, October 20, 1996. 14 The Sporting News, August 3, 1955. 15 Interview with Vin Scully, September 17, 1991. 16 Interview with Vin Scully, September 17, 1991. 17 Robert Creamer, “The Transistor Kid,” Sports Illustrated. May 4, 1964. 18 Curt Smith, Voices of the Game. South Bend: Diamond Communications, Inc., 1987, p. 492. 19 Buzzie Bavasi. Off The Record. Chicago: Contemporary Books: 1987, p. 194. 20 Interview with Vin Scully, September 17, 1991. 21 The Dodgers even requested fans to turn down their radios at one point. See Los Angeles Times, August 4, 1973. 23 Charles Einstein, ed., The Baseball Reader. New York: McGraw-Hill, 1980 p. 273. 24 Binghamton, N.Y., Sun-Bulletin, January 27, 1975. 25 Interview with Vin Scully, September 17, 1991. 27 Washington Post, May 27, 1982; TV Guide, June 12, 1982; Orange County Register, February 18, 1983. 28 Interview with Leonard Koppett, November 8, 1997. 29 Interview with Vin Scully, September 17, 1991. 30 Remarked during Dodgers broadcast, April 2, 1997. 31 Remarked during Dodgers broadcasts, August 17, 2003; June 24, 2006; April 16, 1996; September 18, 2004. 32 Remarked during Dodgers broadcast, June 23, 1998. 33 Remarked during Dodgers broadcast April 29, 2010.